This is what we are talking about. After watching Darren Kuropatwa’s #WhileWalking 66 posted by Amy Burvall in Google+, I started thinking about tags as a part of digital literacy. I am not a very good user of tags. I have been struggling with choosing consistent, clear tags since Delicious switched away from stacks. Since Tagxedo only uses individual words, the compound word tags are not shown, but this image does give an overview of what we are talking about. As I make my tags in the future, I will endeavour to use these words alone or in combination in addition to my own idiosyncrasies. 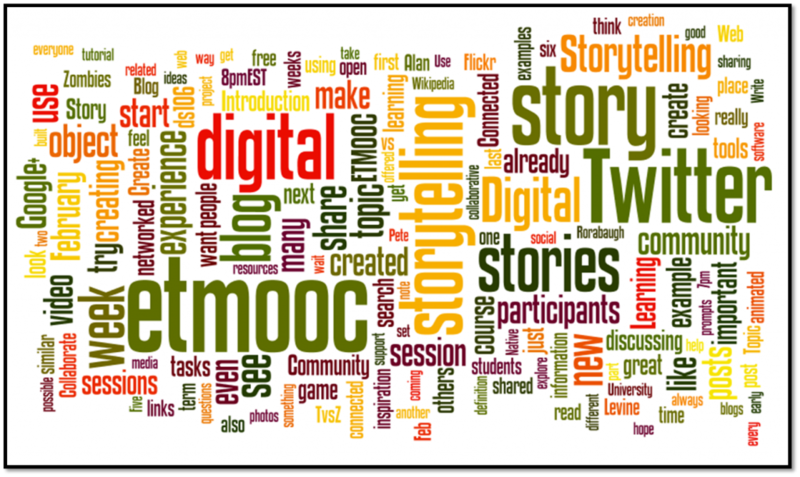 Out of curiosity, I fed the ETMOOC blog feed into Wordle and this is the image created. It will be interesting to see what will change as we move into Digital Literacy. I thought that I would be able to see tags on other people’s blogs. This turns out to be more difficult than it sounds since many blogs do not list their tags. Visiting at least 100, I copied the tag lists from 33 blogs into a Word document. To choose the blogs, I started with the current postings (on Feb. 17, 2013) in the ETMOOC blog hub feed. Then I looked through all the blogs from James Dykstra’s (@mrpuffin) Twitter list of Canadian Educational Folk. I also added a few blogs from people I follow. Once I felt I had enough “data”, I copied the full Word document into Tagxedo. The application automatically choose the most frequently used words. This is a picture for Gemma Holtam’s “Choose your own adventure” digital story for ETMOOC. Looking forward to seeing what comes from it! As part of Digital Storytelling for #etmooc, we were challenged to make an animated GIF. 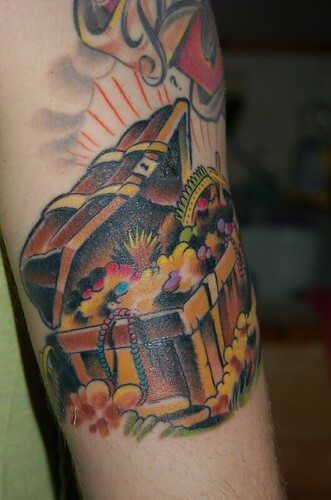 I’m pretty happy with the result. It shows the action, excitement and effort of the final game of the season. I struggled with using Gimp. Truth be told, I struggle with all photo editing. The pictures were too big, the scale was different in each picture, there were other players in the frame that flash awkwardly in the animation and it was just ugly when done. Finally, I gave up and went to the iPad. I searched for a highly ranked free photo editor that also made GIFs and settled on Fotorus. Then I dropped the images in Dropbox on my computer and saved them to the camera roll from Dropbox on the iPad. In Fotorus, I cropped all the images so my son was the same size, then used the auto-enhance so the colours were similar. Next I pulled them all into the GIF editor and chose the “matrix” filter. Making the GIF on the iPad was quite easy, but I was frustrated with getting it off the iPad. The app easily saves to Twitter, Facebook and Tumblr, but GIFs do not show in the camera roll and the email was empty that I sent myself. Eventually I posted it to Twitter and downloaded it from there onto my computer to be able to post it here. Whew. Workflow on the iPad is crazy sometimes. I have updated my Prezi that I use to introduce teachers to blogging to include teacher and class blogs by subject area. Since I work with secondary school teachers, they often want to see an example in their subject. If you have or know of a great class blog that I should include, please let me know in the comments. My 5 Words? We’ve just scratched the surface! It’s been a fun couple of weeks! I have learned so much in ETMOOC already and I know we have just scratched the surface. 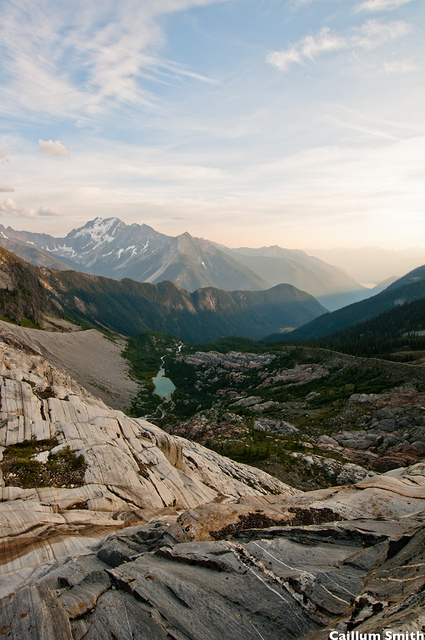 However, over time, glaciers that scratch the surface of the earth create breathtaking beauty! Although I am enjoying all the tips and tools, I am really looking forward to developing relationships and becoming a better teacher. Most of this post is what I learned from the Intro and Advanced Blogging webinars and the links people posted during the chat of the webinar. I intend for it to be a used to support a group of teachers that are new to blogging along with this presentation. Link to others in posts. It is a professional courtesy. The net is a net because of the links. Hyperlinking to where you got your inspiration or to give more detail establishes a chain of information for anyone to follow without creating excessively long posts. It creates pingbacks so that even if you don’t comment on a post, the blogger knows you have read their post and found something of worth. A great way to establish your “brand” and provide your PLN with an easy way to find you. My background image is from a family trip on an Alaskan cruise last summer. I love it for combining all the streams of information. It is very visual, but also allows you to interact with your PLN by commenting, retweeting, etc. I like how I can also mix in my Facebook feed, where I only connect to family and close friends, without linking Facebook with my professional communities. Images are very important in blog posts. 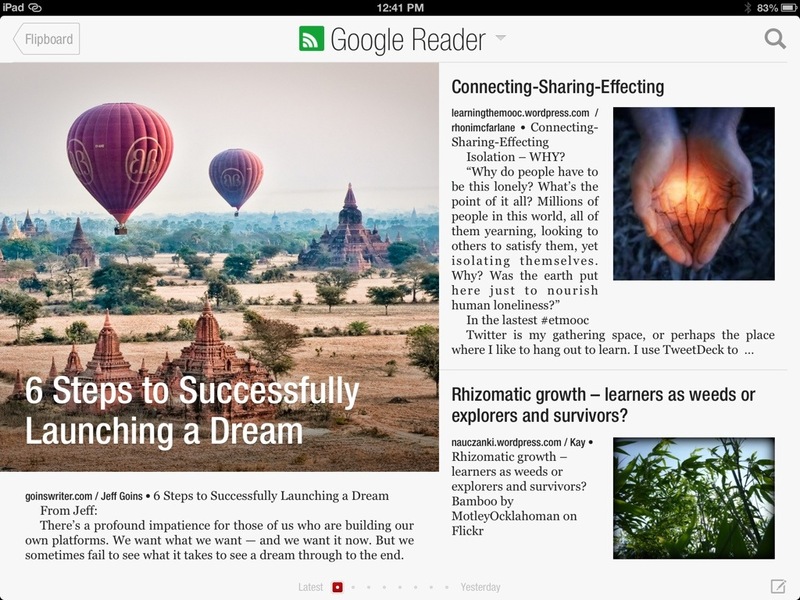 Seeing how blogs are presented in Flipboard, Google+ and Google Reader, I understand how important it is to have a visual to accompany your post. Of course, images or other media can be the whole post. Try out this “An image in 5 words” activity to “kick start your blog”. Easily find Creative Commons media and the meanings of all those CC licenses! Easily create correct attributions for images you use. Use Compfight either as a plugin in your WordPress blog or directly on their website. Edublogs runs a filter that prevents inappropriate image searches. Comment often and add some html code to comments. Comment boxes do not allow for formatting. Adding some HTML code allows you to use bold, italics, etc. and to hyperlink to other pages/blogs. Thanks go out to someone in the Advanced Blogging webinar who shared a link to Mrs. Yollis’ post. If the kids in Grade 2 and 3 can do it, so can we! Try it out in the comments below! Music Island Journey Reprise by Ivan Chew is licensed under a Attribution Noncommercial (3.0). While looking for a background image for my about.me page, I was enjoying my pictures of Italy from the summer of 2011. One of the highlights of the trip was a visit to the Blue Grotto on the island of Capri. I appreciated Serge Puchinsky’s post about the Advanced Blogging webinar and how he plans to put into practice what he has learned in ETMOOC for his posts. So I challenged myself to make a video about this amazing experience. The people we shared a boat with had been to Capri 3 times before but could not get into the cave because the waves were too high but we had perfect weather. I tried using Youtube’s video editor but was not able to add pictures along with video. Instead, I made a Windows Live Movie Maker video. I would never have chosen WMM a couple of years ago over a web tool, but Movie Maker has become really intuitive and has many features that allow you to personalize your video. It probably would have been easier to make an Animoto, but it’s great to try new things and learn new skills! Between participating in the Blogging webinar with Sue Waters as part of #etmooc yesterday and a Lance King workshop today, I’ve been immersed in some great ideas lately. 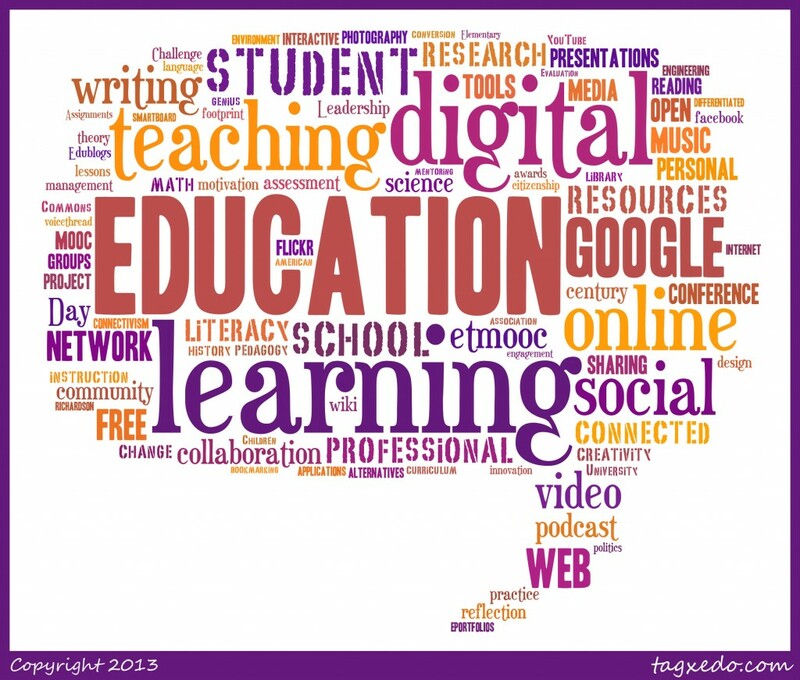 During the webinar, we were encouraged to blog about our learning and experiences from etmooc. Sue suggested we write for ourselves and not to worry about what our readers wanted to read. Today, Lance King’s declaration that “failure is just feedback” was a further push. “Just write,” I said to myself. Write and learn. I have been working with teachers as they develop class blogs and eportfolios with their students and have done some blogging but I struggle with blogging consistently. Part of what stops me from sharing my reflections is that I work with teachers and not students. I feel torn between the desire to share my struggles, insights and reflections, and the privacy of the teachers I work with. Occasionally my role as an instructional technology resource teacher, and the “board office” policies that I am to represent, conflicts with my own beliefs and/or some teachers’ perspectives. I have admired other bloggers who are administrators or other leaders who successfully blog and respectfully manage all these factors. For example, Erin Paynter is a vice-principal in Ottawa who has very reflective, respectful posts. 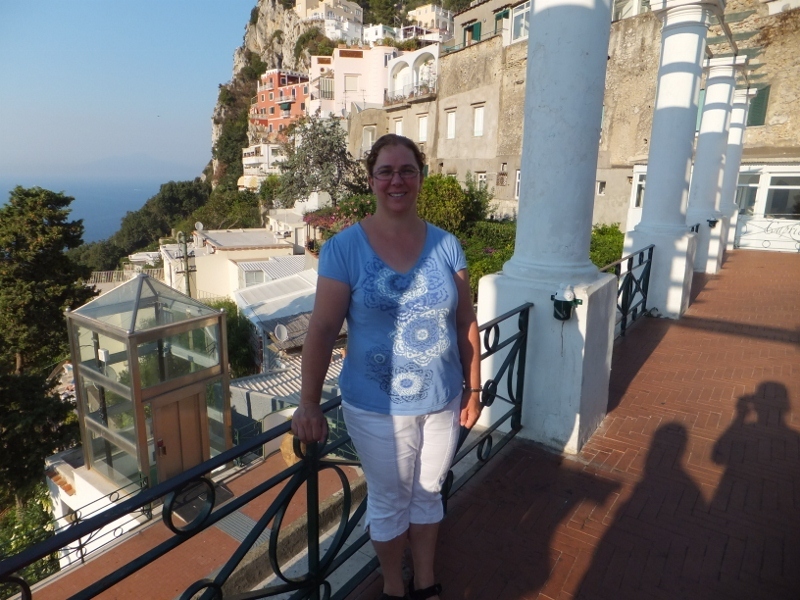 Shelly Wright is a high school teacher and consultant from Saskatchewan whose teaching practice and reflections are inspirational. She pushes the envelope but is honest, thoughtful and respectful. I hope to connect with many more honest, thoughtful and respectful teachers during etmooc and beyond. And I hope to write more. Write and learn.